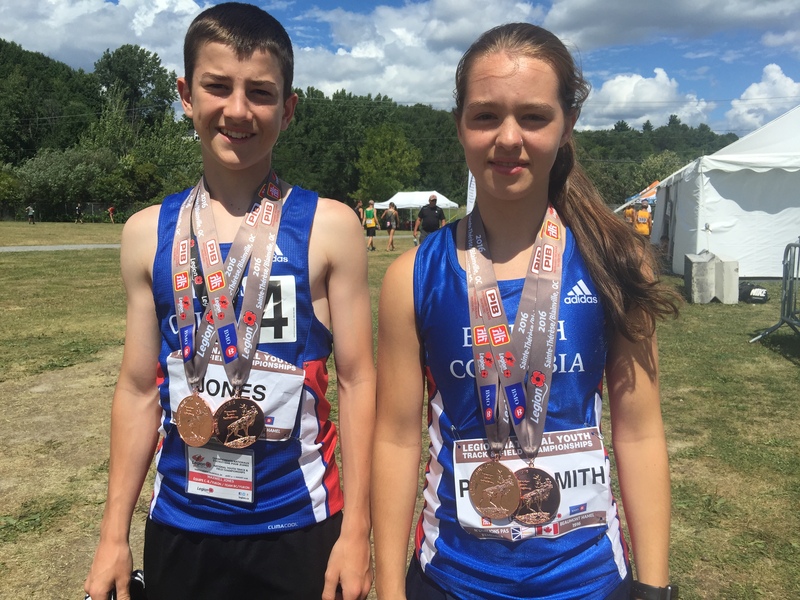 Competing for Team BC at the 2016 Legion Nationals in Sainte-Thérèse, Québec, Royal City athletes, Max Jones and JV Patry-Smith, both brought home a pair of bronze medals. Max Jones, competing in the U16 midget pole vault, jumped 3.20m to tie for second place which required the officials to go back to number of misses at previous heights to resolve the tie. Max also competed on the 4×100 relay team running the third leg. Team BC won the bronze in a time of 46.06s behind Team Alberta and Team Québec. JV Patry-Smith won bronze in the U16 midget shot put with a personal best throw of 12.09m. JV also competed in javelin and snuck into the medals on her last throw of six with a toss of 38.21m, just missing out on silver by only 2cm. Royal City also had three other athletes competing at the national meet. U18 youth javelin thrower, Brianna Bates, placed 5th with a toss of 37.98m, only 2cm off of 4th place. Ryan Jensen, U16 midget boy, ran a 16.17s 100m hurdler race into a very stiff headwind, putting him tied for 15th spot overall. 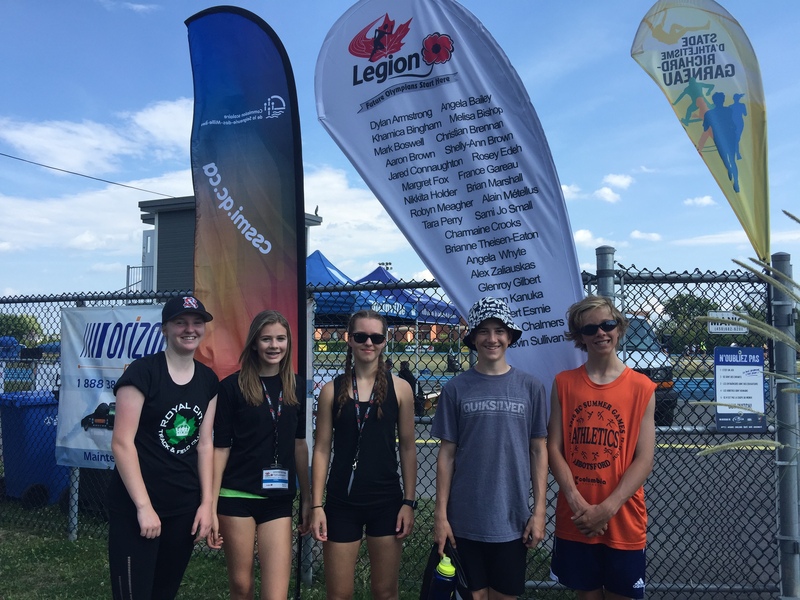 Lauryn Savela competed in the U16 midget girls javelin but failed to advance as her three preliminary tosses were all called flat by the officials. RCTFC JD athletes show well at JD Champs 2016! Congratulations to all RCTFC JD athletes who competed at the 2016 JD Championships hosted by Ocean Athletics July 29-31. All competitors are to be recognized for personal best performances as a finale to their competitive season! Highlights include: 13 year old Katie Stewart Barnett’s trio of medals (Gold in 1200m and 2000m and Silver in 800m); Emily Bowles Bronze in 1200m for 12 year old girls; Kathryn Doyle’s Bronze in Javelin for 11 year old girls; Noah Brolin’s Bronze in Shot Put for 10 year old boys, Jaden Knight’s Silver in Jav for 13 year old boys; Markus Savela’s Bronze in Jav for 10 year old boys; Julian Lauritzen’s Bronze in 600m for 9 year old boys; and Max Holmes’ Silver in 600m for 10 year old boys.